The William Pryor Letchworth Museum houses a collection relating to the Indian and pioneer history of the Genesee Valley as well as archeological and natural history displays. It is located in the Middle Falls Area of the park near the Glen Iris Inn. 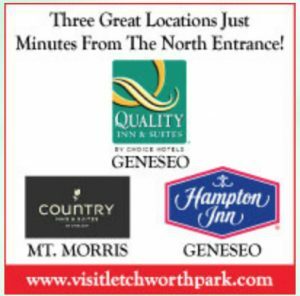 The museum itself was built in 1912 and was planned by William Pryor Letchworth to expand his original Genesee Valley Museum which was built in 1898. The museum is open from 10 am to 5 pm, seven days a week, from May 1 through October. The suggested donation is $1.00/adult and $.50/child, $3 per family. The museum phone is (585) 493-2760. The History Department phone is (585) 493-3616. Council Grounds with the Seneca Council House, Nancy Jemison cabin and the Mary Jemison statue and gravesite. Located on a bluff behind the museum. Glen Iris Inn, former home of William Pryor Letchworth and now a country inn and restaurant with a view of the Middle Falls. Parade Grounds, a Civil War camp and training grounds for the First New York Dragoons. Located in the east area of the park. St. Helena and Gibsonville, “Ghost Towns of the Genesee,” were thriving villages now vanished from the valley. Genesee Valley Canal Locks, historic site.